I find it hard to understand why anyone should want to visit the Ripper tourist attraction in East London, and it would seem that not many do. 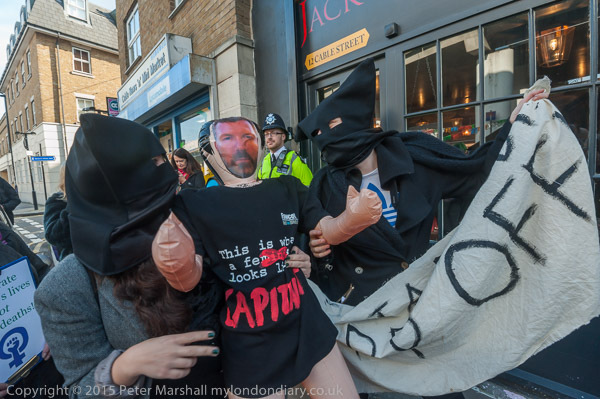 You have to have a particularly perverted lack of humanity to want to “have a selfie” with someone dressed in a Jack the Ripper costume “in his sitting room where he planned his horrific murders” or even worse “a picture with Jack in Mitre Square together with the body of Catherine Eddowes“. But such was the publicity for a Halloween event at this so-called museum. Of course we can’t know what his sitting room looked like, or even if he had one, as his identity has never been fully established, with a whole ‘Ripperology’ industry which sometimes seems more designed to obscure than solve the mystery. The most convincing case is made out for Montague John Druitt, an exceptional sportsman from Winchester College and the son of a doctor, thought to have been suffering from an inherited mental illness and he appears to be the man the police (and possibly Druitt’s family) were convinced was the murderer, though they had no proof. But they did stop special vigilance patrols and give up on their investigations after his body was found in the Thames. 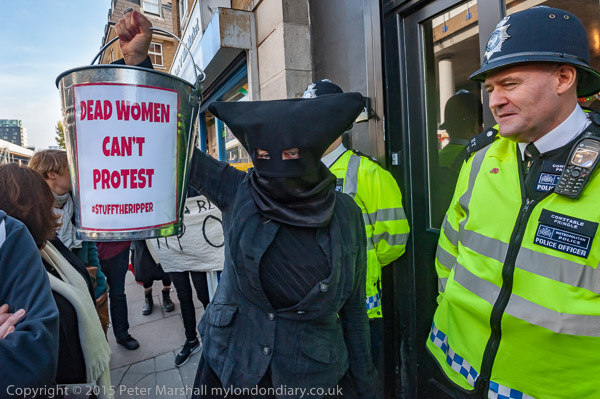 Unsurprisingly the “museum’s” publicity tweet inflamed those who have been protesting against this sordid venue, and they – including organisers 4th Wave London Feminist Activists, the Sisters of Perpetual Resistance, Class War and others – came to protest, bringing with them a life-size inflatable doll wearing a feminist t-shirt and a face-mask of the “museum” proprietor Mark Palmer-Edgecumbe. 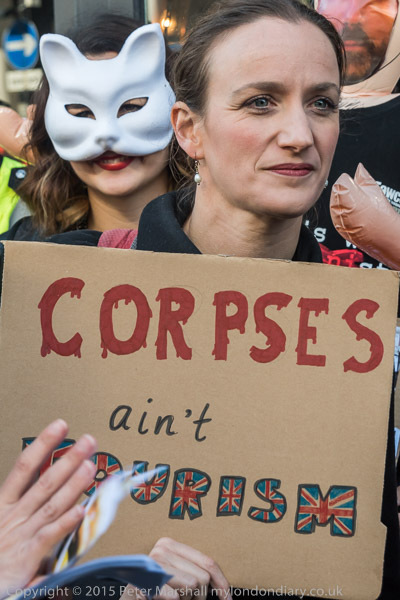 People, including comedian Kate Smurthwaite, posed for “selfies” with the doll, and it was stamped on by the Sisters of Perpetual Resistance and others. But I had to leave before the end of the protest. 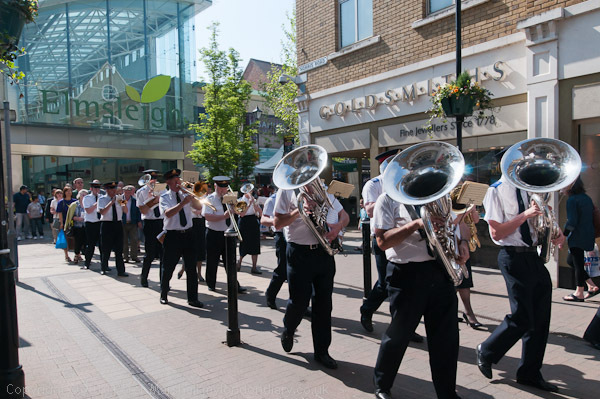 It was a slightly difficult event to cover, as the protest mainly took place on the rather narrow pavement outside the “museum”, though later as it spilled out onto the road (and stopped the traffic) things became easier. Much of the time I was using the 16-35mm lens at its widest because it wasn’t possible to get any distance between myself and those I was photographing. Flares are coming back into fashion. Not the flares I used to wear back in the late 60’s, natty though those were. I had to get rid of mine long ago, as although the legs were still wide enough, it has been some time since I had a 32″ waist. But flares at protests. As a photographer I have mixed feelings about them, or indeed flames of any sort. They certainly add a little colour and excitement, but they do create problems with exposure that are sometimes insoluble, and often very easy to get completely wrong. Good though Nikon’s matrix metering is, it usually fails in these situations. The smoke too restricts visibility, and once you are inside the cloud it can get very difficult to see and photograph. I also worry about the effect of the smoke on my lungs, and it certainly can be very unpleasant. Lightroom does often need to come to the rescue, and the De-Haze slider introduced not long back can often help. Even better is the more recently addition of De-Haze to the local adjustments brush. 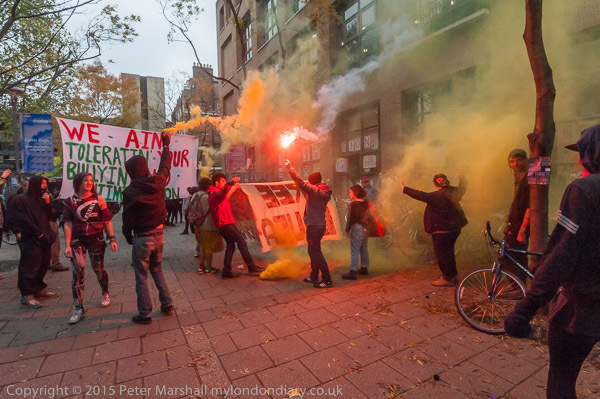 Protests outside SOAS are often visually interesting, and the flares certainly added something. I was also pleased to be able to support Unison Branch Secretary Sandy Nicholl who I’ve photographed at many different protests over the years, and who had been suspended by management for his trade union activities, in particular related to the then current student occupation of part of the university gallery building. 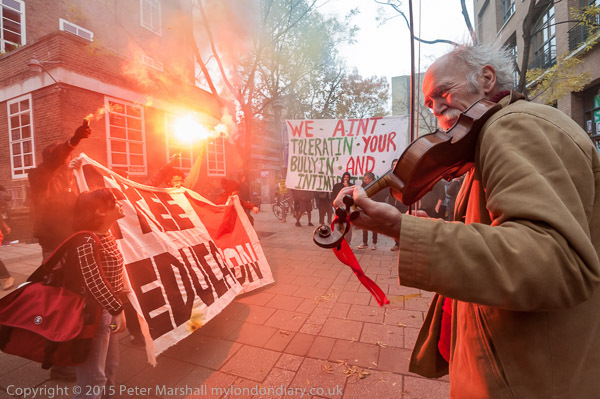 You can see and read more at SOAS Shut Down after Sandy suspended. A few days later he was re-instated. Probably the protest helped management see sense. 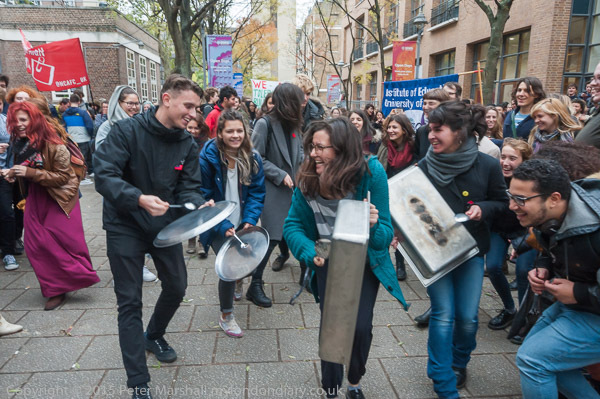 Dancing has also often been a part of protests here, and on this occasion it was the ‘Strikey-Strikey‘, a version of the hokey-cokey with a mad rush into the centre of the circle at the end of each verse. As someone who photographically likes to be in the middle of things, I was rather in danger of being overrun, particularly as most of the time I was viewing the scene through a 16mm lens (and sometimes, even worse, the 16mm fisheye), which makes anything more than a few feet away seem quite distant. I almost missed the flares – and I think the few other photographers who had been at the protest mainly did, leaving before the end when they were set off. It’s always hard to know when it is safe to leave an event, and its often a case of what is next in your diary for the day. Fortunately I had a little time spare before an early evening meeting and was in no hurry to leave. We are also in an age where getting images on-line fast is more important in terms of earning than getting good images. Agencies want them if possible before things happen, and at many events photographers are sitting down and tapping away on their notebooks less than ten minutes after they have started. Apart from missing the development of stories, they are also having to work with jpegs, sending them off with little or no adjustment. While that’s fine for some images – particularly those in relatively flat lighting – it would have been pretty hopeless with the images I took of those flares. 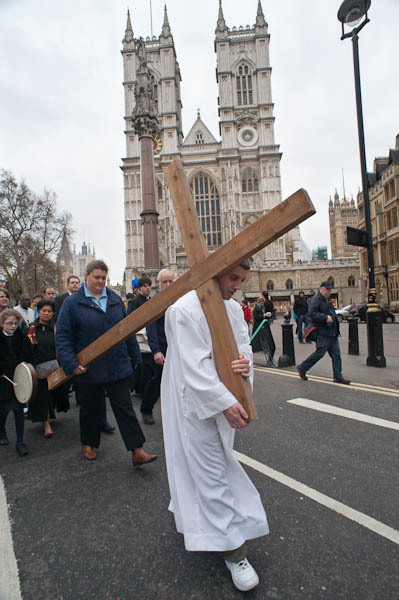 Most years I’ve photographed Good Friday events, but this year I find I had to stay at home waiting for some of my family to arrive. 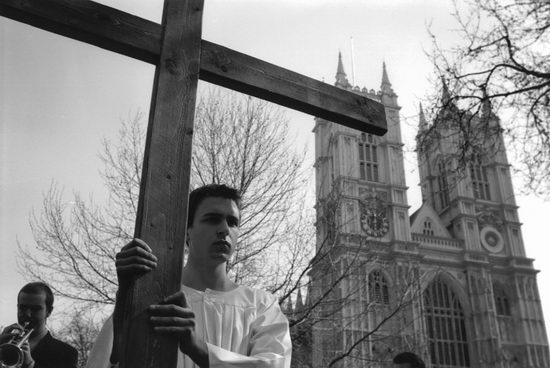 Until a few years ago I used to go regularly into central London to photograph the events there, in particular at Westminster, where the Catholic Cathedral, Westminster Abbey and Methodist Central Hall, sometimes along with others carried out a march with open-air services, the Crucifixion on Victoria St. 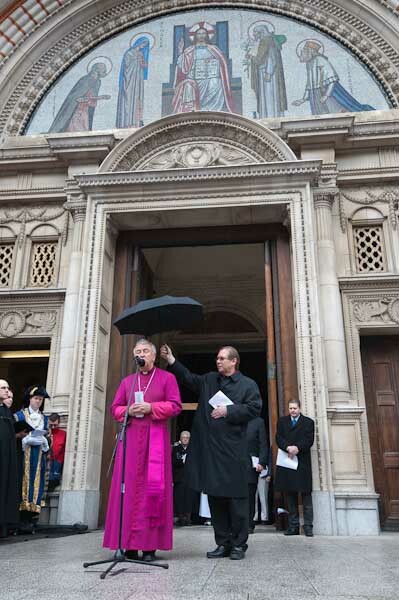 The last time I went up to Westminster for the event was in 2010, which was the first time that the Most Reverend Vincent Nicholls, Archbishop of Westminster took part. By now the annual celebration had become something of a media scrum. 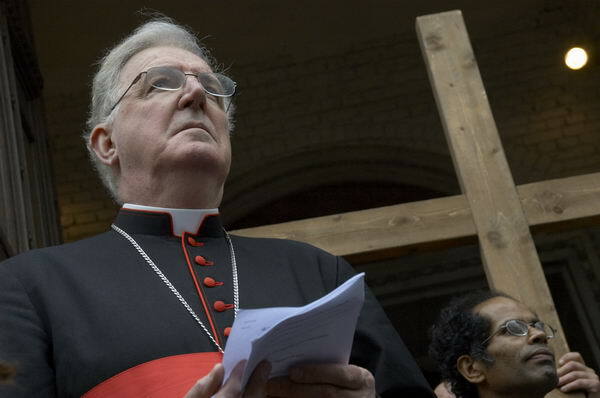 I’d long been rather disturbed at the behaviour of some other photographers at these events, particularly in front of Westminster Cathedral, which seemed to me to be quite out of keeping with the religious nature ofthe event, and the next year I was reluctant to take part in it, covering instead a local procession of witness. Which I also attended for the following few years until now. 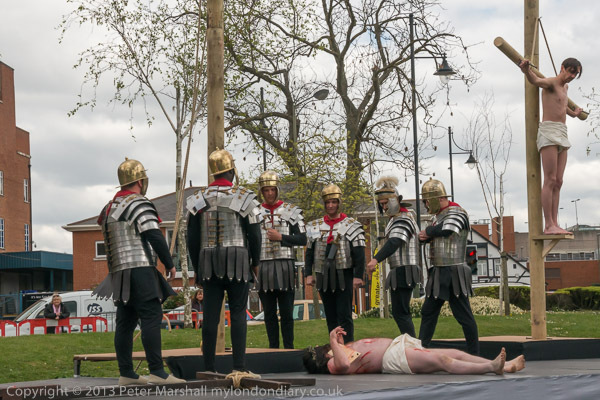 The last couple of years it has been made a little more interesting with the attendance of Roman soldiers and other actors from the Staines Passion which has taken place on the following day. Tomorrow sees the final free performances of the three-year run. Despite suffering from a terrible amount of that horrible creeping zoom that really does mess up looking at still photographs – which get much of their power from the fact they are still, fixing a moment in a way that video or film doesn’t, Zisis Kardinos‘s Glasgow by Raymond Depardon is worth watching. The powerful atmosphere of his images still comes across, and the musical accompaniment generally goes well with the pictures, apart from one rather embarrassing moment with a “1.2.3” where it persuaded the editor into a very silly visual trick. If nothing else, it got me looking for the pictures themselves, and you can see 82 of them on the Magnum site, starting here – then click on the first image, then ‘show image only‘. It’s just slightly disappointing that clicking on the ‘View information’ link below the pictures adds nothing, and makes the image smaller again, but good to be able to see them. I’ve not seen the book, simply titled Glasgow, but you can read about it in ‘The Scotsman‘, and a more perceptive and personal view from someone who was a 13-year-old growing up in Glasgow when Depardon made his two visits to photograph the city. It might have been a little less dangerous than his work the same year covering the civil war in Beirut, but in the ‘Dailyrecord‘ you can read some of the photographer’s own thoughts – and how despite being “shocked by the destitution” he loved every minute of his time there. It says a great deal about about the political direction of the British press that the Sunday Times which had commissioned the prize-winning photographer to give his personal view of the city decided when they saw it not to publish it. It wasn’t, as most writing about it now seem to believe that it was shocking, but that it was an unpalatable truth. Then as now there are many stories that don’t get published, stories that the papers and particularly the BBC, never mention or quickly buries to keep on the right side of proprietors and their political allies. Depardon’s work showed the Thatcher era only too clearly. The bi-lingual book Glasgow (ISBN-10: 202130362) came out at the end of February from Editions du Seuil and has text by William Boyd, who studied in Glasgow in the 1970s. Some of the pictures were shown at the Grand Palais in Paris from Nov 2013 until February 2014 and are perhaps the best reason to go and see Strange and Familiar which is at the Barbican in London until 19 June 2016. There was a great outcry back in 2013, particularly in the photographic world, when Adobe decided that their new software releases would be made on a subscription basis. I didn’t really go along with this, not least because I think I was the only photographer I knew using a more or less legal version of the software and having over the years turned down offers of ‘cracked’ upgrades from friends. I’d got copy of Photoshop when I was a teacher at education prices, which seemed to me to be a sensible amount to have to pay for the software, and had upgraded it over the years as far as Photoshop 7. Then I’d given up, as it seemed to do all I wanted, and the upgrades weren’t cheap. Like most photographers, I only use a small subset of Photoshop’s features, and it was priced too high for the market, while Elements seemed clunky and lacked just a few vitals. I’d also got a legit copy of Lightroom 4. I’d had it from the start, after Adobe had bought up the superior technology of Pixmantec’s Rawshooter in 2006 and closed it down giving registered users a free copy of Lightroom 1.0 in 2007. It wasn’t really much of a bargain, as Rawshooter was rather better at converting raw files than Lightroom, but I could see the advantages of incorporating image management. And when you bought a new camera – and things were then developing fast on the digital camera front – Rawshooter would no longer handle its files. I looked closely at the alternatives, owning copies of several on my computer and decided for all its current weaknesses that in the longer term Ligthroom was likely to be the best bet. Though version 1.0 came free, I had to pay to upgrade to v2 in 2008, v3, v4 in 2012 and v5 in 2013 as I upgraded cameras – and also wanted the new features. So when a reasonably priced subscription including both Photoshop and Lightroom became available it seemed a reasonable price to pay, especially as Photoshop now included rather better and much faster retouching tools for working on my scans from negatives, many of which are in poor condition. And so far, despite the many warnings when the subscription scheme was introduced, Adobe have played fair. Every month I pay them £8.57 (inc vat) and the software is fine – with a recent update to Lightroom CC 2015.5 and the latest Photoshop. But while I’m happy with these programmes (and an old version of InDesign CS5.5 which I got as a relatively reasonably priced upgrade from Pagemaker), the actual Creative Cloud application is something of a pain, as it seldom works for more than a day or two, giving a message on starting up the computer that it needs the latest version to be installed and refusing to load. Looking on the web, I seem to be among many others having a similar problem. I’ve tried ignoring it, but that means I don’t get notified of any updates – and eventually the software refuses to work properly. If that doesn’t work, you can always log in to Adobe and download and reinstall Creative Cloud. But deleting the file has been a quick and easy fix for me – though of course I disclaim any responsibility for what it might do on your system – it’s Adobe’s suggestion and not mine. Given the problems that many of us have, surely Adobe could and should do something to make Creative Cloud more resilient and less liable to sulk in this way? It’s really the only little thing that stops me wholeheartedly recommending their photography plan to all photographers. I’m currently struggling through the key-wording and adding other information for several hundred images which are moving from ‘news‘ to ‘stock‘. It’s a slow and tedious business, and one that I find rather annoying, partly because of the software I’m forced to use by the particular agency involved, which doesn’t allow any sensible batch processing. Among other things this means that I have to go into every single one of the several hundred images and click to say how many people are present and that I don’t have model releases, that they have property which would – for advertising use, but these are editorial images – a property release which of course I don’t have any either. Just being able to set a sensible default would save me several thousand mouse clicks today. I might have taken 30 pictures in the same location, but again I have to load up each image individually and past it in. Often most of that 30 will have very similar keywords, but those too have to be pasted individually. What might, with well designed software take perhaps 30 minutes, ends up being a day of tedious work – and what seems to me a real expression of contempt by the agency concerned for its photographers. Most of it would actually be unnecessary, in that all of the images when supplied have captions and keywords. The captions probably contain most of the information that would be most useful in searching, but the agency has decided to give them a very low priority in their search system, and the keywords have to be re-allocated into different groups. Its a total mess, and one which I’m sure doesn’t help sales. 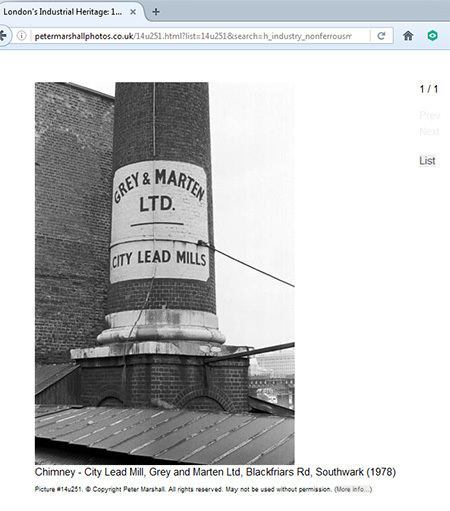 It would help photographers if there were some consistency across the ‘industry’, but of course there isn’t. Back in the day we were taught ‘Who, What, Where, When, Why’ and possibly ‘How’, but that appears to have rather gone out of fashion. In most photo captions the first sentence identifies the people and place in the photograph and supply the date and location where it was taken. The second (and perhaps third) sentence should provide contextual information to help readers understand what they are looking at. and he goes on to give quite a lot of useful advice and examples in the five page document (the last of which is blank!) It includes some good advice on keywords too, a great deal of which I find myself ignoring, sometimes intentionally. You do have to think about the system that you are contributing too, and work to its expectations, however nonsensical they may be. There is a great deal to be said for the use of controlled vocabularies, but I’ve never found a list that suits the kind of work I now do. When I was photographing buildings and industrial sites I made use of a simplified list of terms derived from IRIS, the Index Record For Industrial Sites, which was set up in 1991 to provide a standardised format for reporting in this area. 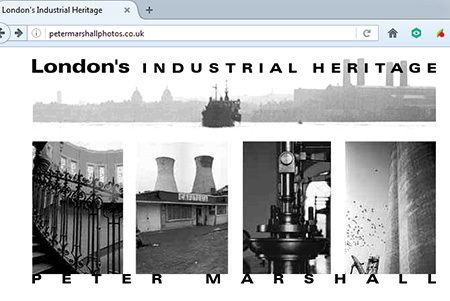 A considerable further simplification provided a basis for my only professionally produced web site, ‘London’s Industrial Heritage‘, written by my elder son. By the standards of the time (it was a birthday present for me in 1999) it was impressive, and is still a rather elegant solution, although the image size and quality now dates it. Perhaps now we should have some rather more clever solutions, perhaps through the application of AI technology to the searches that picture researchers make and perhaps the keywords that photographers use, as well as image description technologies. For the moment, its time for me to get back to that tedious business of adding information the slow and hard way. October 21st started off uncomfortably for me, though nothing like as stressful as it must have been for Lisa McKenzie, in whose trial at Stratford Magistrates Court I was due to appear as a witness for the defence. I’d been photographing the Class War ‘Poor Doors’ protest on April 2nd at One Commercial St when she was arrested and charged with criminal damage for having put a sticker on the window during a protest two weeks earlier, and I’d also covered that previous event, paying particular attention to her, not just because she is one of the livelier of the Class War circle, but because she was of particular news interest for standing as the Class War candidate against DWP minister Iain Duncan Smith in May’s general election. 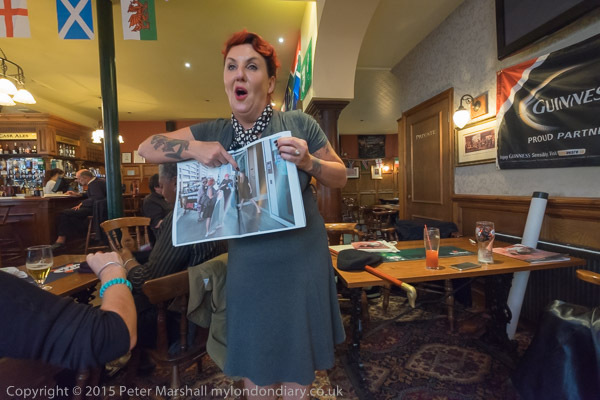 So I had taken a great many photographs of her on the evening in question, and would certainly have photographed her putting up a sticker had she done so – rather than just holding up posters. I hadn’t kept every picture I’d taken that night, but there were enough to show that she never had the two hands free that putting up a sticker needs to peel off the backing paper. Initially there was also a second charge, a public order offence of causing alarm by holding up the poster showing cemetery crosses with the message ‘We have found new homes for the rich’ but it was hard to take that seriously, not least because the police had not taken action against so many doing exactly the same thing. But a few days before the trial, the police and CPS seriously upped the ante, charging her also with ‘Joint Enterprise with Persons Unknown‘ of causing criminal damage. Joint Enterprise is an ancient principle of law which was revived to deal with duels 300 years ago and used in recent years to convict gang members of murder in trials where there is no evidence against them personally, leading to considerable injustice. 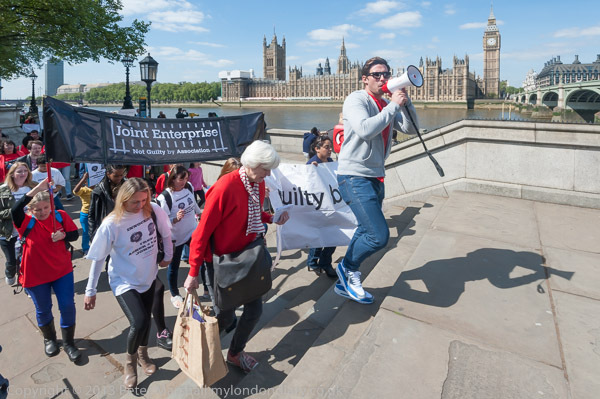 A little over a month ago the UK Supreme court ruled it to have been wrongly applied in many of these cases, thanks in part to a long campaign by JENGbA, short for Joint Enterprise – NOT Guilty By Association, who I’d photographed on a couple of protests. 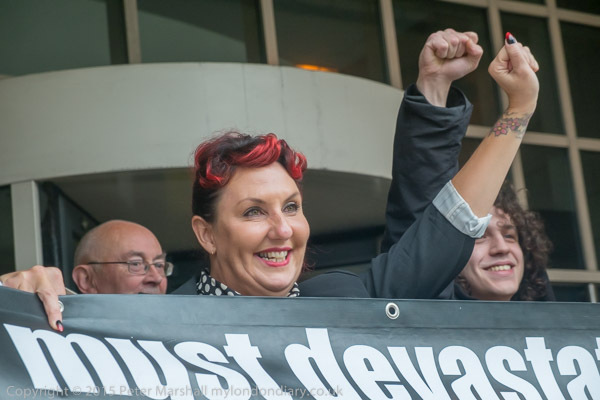 Never before had been used against anyone taking part in a political protest – and if successful would severely threaten the right to protest, with Lisa possibly having her freedom of speech and movement limited by a Criminal Behaviour Order for up to 5 years. 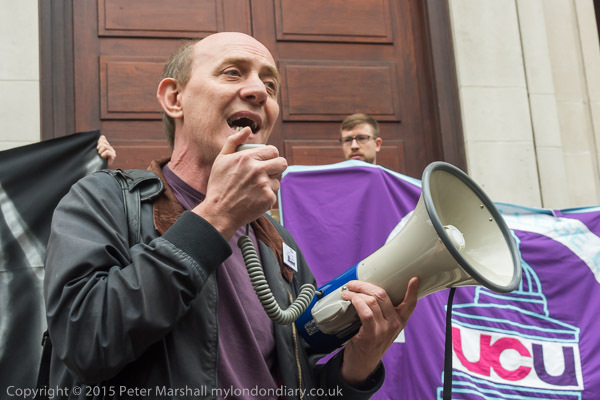 I wasn’t looking forward to having to appear in court – I’ve never been a witness before, and hadn’t slept well, and having to get up early to travel across London didn’t help. At the court I had to hand in my cameras at the reception desk, and then just to sit around while the trial proceeded for several hours. 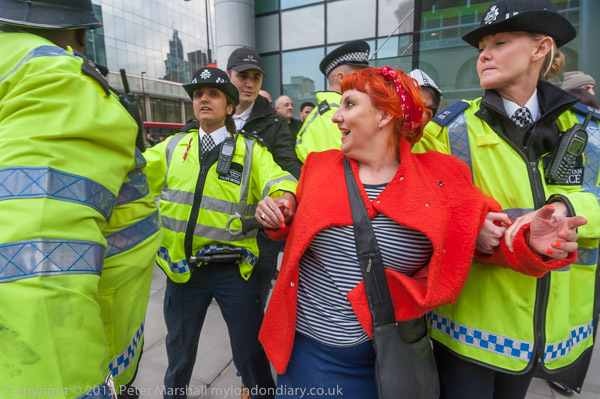 That the police really had no case became obvious when I was told that they had added another charge against her, relating to a protest on March 12th. I had my phone with me, and was able to look up my pictures on My London Diary, which confirmed that Lisa was not even present on that day. But the police withdrew that charge before the case started. The first session of the court looked at some video produced by police at the last minute (and not shown to the defence) and threw out the Joint Enterprise and the public order offence, allowing only the charge of criminal damage to proceed – with the police alleging the cost of removing a small sticker to be £50. I felt both elated and a little disappointed, having being keying myself up for so long to give evidence, but as soon as I heard the verdict rushed to the reception desk to reclaim my cameras and photograph Lisa and ‘persons unknown’ as the left the court. 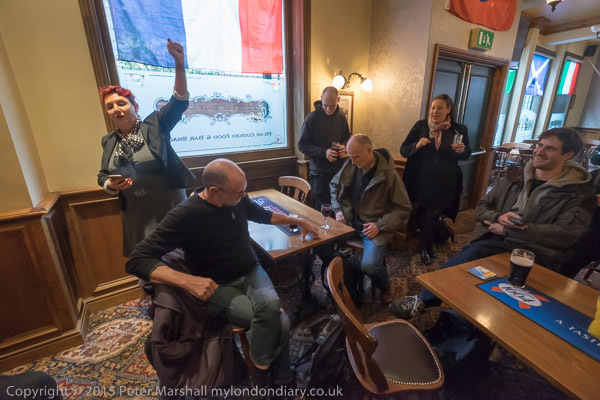 But I soon felt better, as we celebrated her victory in the pub. 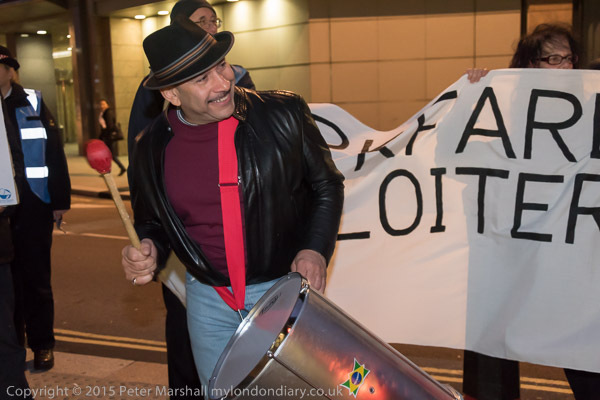 It was the second case in which police have brought charges against people taking a prominent role in the Poor Doors protests which the courts have thrown out, and since then a third case has had a similar outcome. It is had to entertain any conclusion other than that these arrests and charges have been politically motivated. More at Lisa McKenzie Not Guilty! In the Guardian you can read I posed for Paul Strand, in which 73 year old Angela Secchi recalls the day when she was 9 and the photographer came into her native town of Luzzara in Italy. Her portrait was one of many that he made there for his book with writer Cesare Zavattini, Un Paese: Portrait of an Italian Village. It was Zavattini’s home town, but the two worked separately, and Strand’s guide to the town was one of the eight sons of one of the most famous family in photography, The Lusetti Family, Luzzara, taken in 1953. It has long been one of my favourite photographs, and Strand certainly one of my favourite photographers, though that doesn’t stop me being criticising some of his pictures. I’m not too enamoured of the portrait of Secchi, which, like quite a few of his others seems a little too contrived, wearing the oversize hat of her farmer father, put on her head by the photographer. Of course Strand was a very fine portraitist, and doubtless there will be many of his better examples in the show, Paul Strand: Photography and Film for the 20th Century which is at the V&A in London from 19 March to 3 July. This is a rare example of a great photographic touring show – organized by the Philadelphia Museum of Art in collaboration with Fundación MAPFRE and made possible by the Terra Foundation for American Art – coming to the UK, and is apparently the first major retrospective of his work in the UK since his death in 1976. I do remember the previous retrospective – and unlike the current V&A show – I was invited to the opening in Carlton House Terrace shortly before he died. Strand was of course a communist, and worked with a number of others who shared his views; as Fraser MacDonald writes in his detailed essay Paul Strand and the Atlanticist Cold War on Strand’s fine book on the Hebrides, Tir a’Mhurain (1962). You can also read my own far less scholarly account of the New York Photo League originally published in 2001. I’ve always found London’s Barbican Centre a rather confusing place, in fact the whole Barbican estate, a brutalist conception where painted yellow lines on the pathways were found necessary to guide people from the various Underground stations to performances at the centre. It’s the different levels that really make it difficult, with the main walkways being well above ground, linking with a grand post-war scheme that saw a future City of London where pedestrians and road traffic would move at different levels. Away from the Barbican itself, only traces of this concept remain, with parts across and along London Wall having been demolished relatively recently, but most was simply never built, impossible without major demolition (which the Luftwaffe had previously carried out on the Barbican) and incredible expense. But inside the Barbican too is confusing, with different levels and no really clear definition of spaces. Regular visitors and those who work there doubtless soon become used to it, but as an infrequent user I still have problems. But on this occasion I didn’t have to worry. The protest by the United Voices of the World, the union representing the cleaners at the centre began at the entrance to the centre on a proper London street shown on the A-Z, and when a small group of cleaners led by UVW General Secretary Petros Elia ran inside, evading the security staff, all I had to do was follow them into those confusing depths. 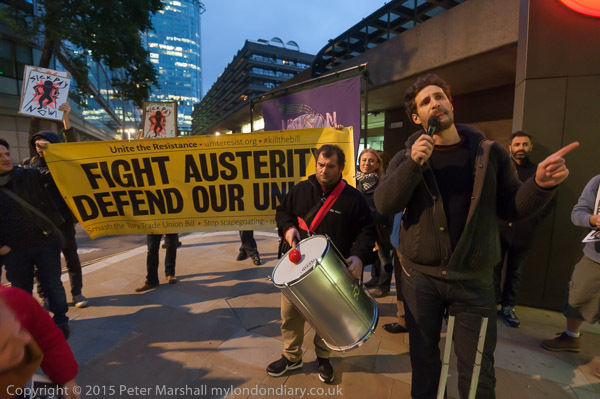 Outside it was dark, with relatively little light from street lamps and in some areas where the protesters were standing rather more coming through the glass doors and windows of the Barbican entrance. With the Nikon D810 I was working with the 28-200 mm f/3.5-5.6 in DX mode (42-300mm equiv) at full aperture and ISO 3200, in shutter priority mode at around 1/60th second, augmenting the available light with a little flash from a SB800. The flash wasn’t doing a great deal (though you can see its effect in some images) as I was using the 16mm fisheye on the D700 at similar apertures and ISO, without flash at shutter speeds from 1/15-1/50th. When we rushed inside, the light levels were not all that different,but I had changed from the 16mm fisheye to the 16-35mm f4. 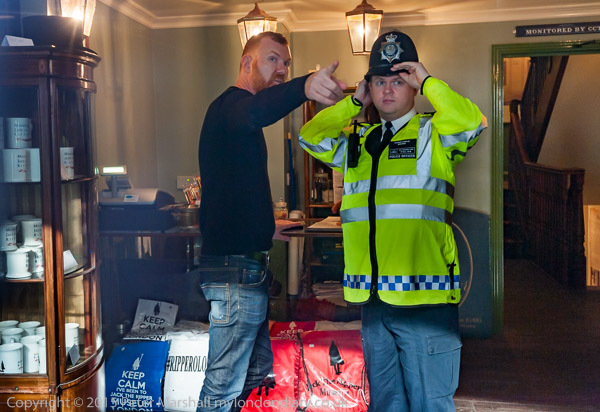 I generally prefer not to use flash when photographing such incursions, as it makes it much more likely that security will take notice and ask you to stop taking photographs or to leave. I did take a few images with the D810 and flash, but generally needed a wider angle of view, and almost all of the better images were made with the 16-35mm. 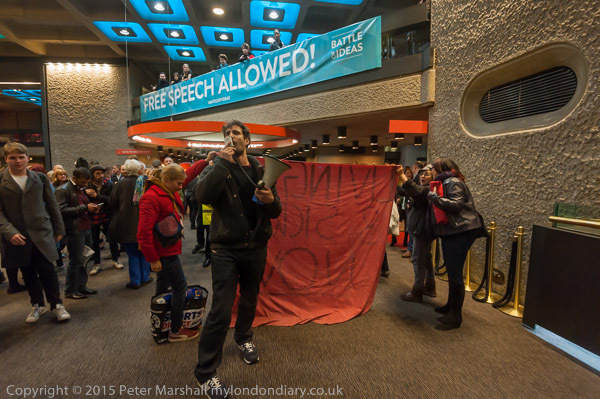 The spot which the UVW chose for its protest inside was in a foyer area of the centre, and overlooking it was a balcony from a higher level, draped over which was a banner for an event taking place on that weekend, ‘Battle of Ideas’ with its message in large capitals ‘FREE SPEECH ALLOWED’. This protest wasn’t what they had in mind, but the banner certainly fitted. 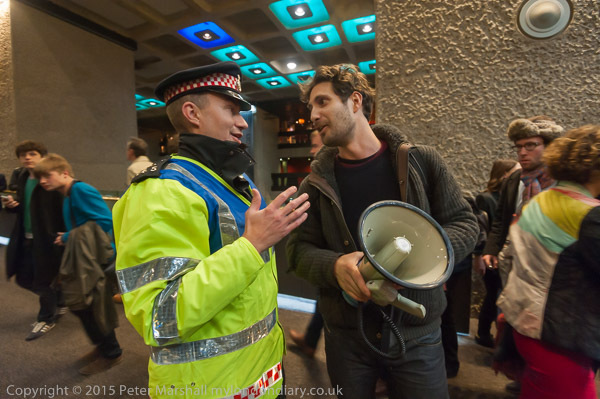 Although the security weren’t too happy about the protesters being there and speaking out. It was at first difficult as the protesters were largely facing the banner, but eventually I was able to get the picture I wanted. 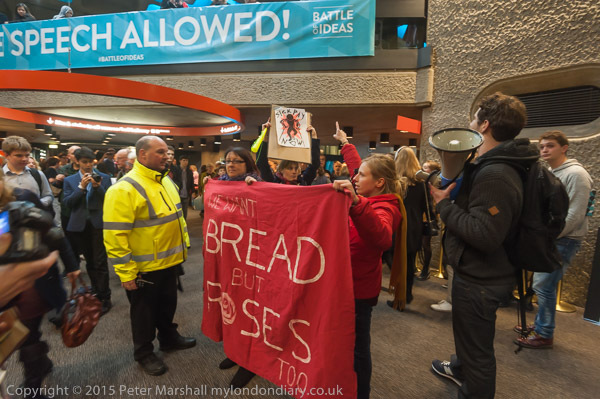 The Barbican’s reaction was one of moderation, and when the protesters carried on after being asked to stop and leave, they called in the police, and a very polite conversation ensued, with the protesters agreeing to leave peacefully and continue their protest outside. 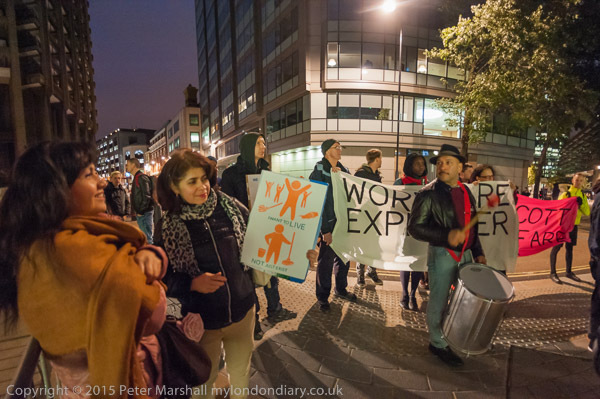 More pictures and text about the cleaners demands for a proper living wage and decent conditions of service at Cleaners protest in Barbican. Good to see a short photography lesson from The Guardian, How to fake a giant rat. It’s perhaps a pity that they spoil it a little by continuing the title “(and why you shouldn’t trust pictures on the internet)”, as it isn’t really a story about the Internet, but something that illustrates a very basic fact of photography, and one which of course used to feature in photography courses long ago. he article quotes news agency SWNS as correctly saying “clearly perspective plays a part in it”, and it goes on to comment that the image was used by everyone “from Sky News to the Daily Mirror to the Evening Standard” without comment or bothering to check whether the rat was really four foot long. These guys may be publishing on the Internet, but they are major media outlets and employ journalists. They even still employ a few photographers who could have advised them. Had they asked, but it was a better story without the facts. It isn’t really a story about the Internet. Or really about photography. But about journalistic standards and competency. You are currently browsing the Re-photo blog archives for March, 2016.